Ontario, CA – The Ontario Reign, proud American Hockey League (AHL) affiliate of the Los Angeles Kings of the National Hockey League (NHL), take on the San Antonio Rampage tonight at 5:00 p.m. PT at AT&T Center in San Antonio, Texas. Tonight is the first of six meetings between the two clubs this season. In three preseason games, forward Matt Luff recorded four points (three goals, one assists). He enters his first professional season tonight after completing a three-year junior career in the Ontario Hockey League. 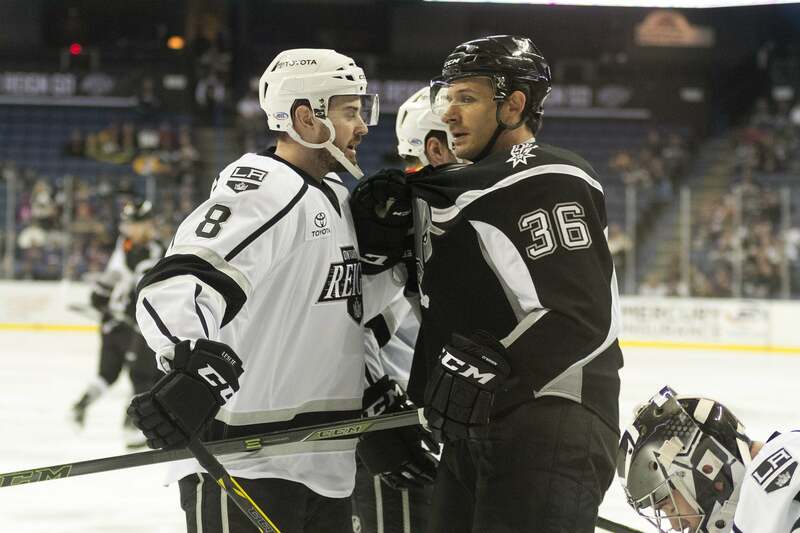 The Reign are 2-0-0-0 in season-opening contests since moving from Manchester, New Hampshire. They defeated the Bakersfield Condors 5-0 in Bakersfield, California to open the 2015-16 season and took down the San Diego Gulls 2-0 in San Diego to start the 2016-17 campaign. The Reign went 4-1-1-0 against the Rampage last season and hold an all-time record of 8-1-3-0. The lone regulation loss came back on November 9, 2016 in a 5-1 setback in Ontario. The Reign are 5-0-1-0 at AT&T Center. Of the 24 players listed on the Reign’s 2017-18 Opening Night roster, 10 are rookies this season. Philippe Maillet, Matt Luff, Matt Roy, Matt Schmalz, Keegan Iverson, Bokondji Imama, Sean Walker, Spencer Watson, Cal Petersen and Matt Marcinew are entering their first full professional season. Forward Justin Auger looks to appear in his 200th professional game tonight vs. San Antonio. Over 199 games, Auger has 43 goals and 42 assists for 85 points. Forward Rocco Grimaldi returns to the Rampage after leading the team with 55 points last season (31 goals, 24 assists). Rookie J.C. Beaudin looks to make an immediate impact for the Rampage after scoring 80 points (30 goals, 50 assists) with Rouyn-Noranda Huskies in the QMJHL last season. Defenseman David Warsofsky is coming off a career season after recording 47 points (16 goals, 31 assists) to finish second among all skaters with the Wilkes-Barre/Scranton Penguins and he was named to the AHL Second Team All-Star. The Reign continue a season-opening three-game road trip on Friday, October 13 against the Iowa Wild at Wells Fargo Arena in Des Moines, Iowa at 5:00 PT. The road trip closes on Saturday, October 14 in the first-ever meeting with the Chicago Wolves at Allstate Arena at 5:00 PT. Follow the action at OntarioReign.com and on Facebook at Facebook.com/OntarioReign!